Last week a team from the Product Stewardship Institute took a tour of a materials recovery facility (MRF; pronounced “murph”) operated by Casella Waste Systems in Charlestown, Massachusetts, which recycles material from municipalities in the Boston area. We would like to thank Lisa McMenemy, the Municipal Development Representative at Casella, for being such an informative tour guide and leading us through all the steps of the recycling process. 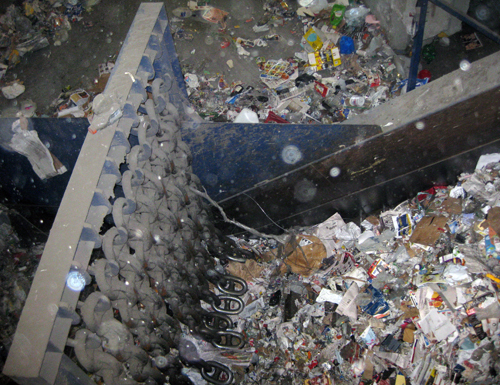 The Charlestown MRF was converted to a single-stream (also known as Zero-Sort or fully-comingled) facility in 2009. The concept of single stream comes from Europe and is widely believed to dramatically increase the recycling rate because of the added convenience for consumers, although the quality of the materials recovered is lower. Single-stream allows for recyclable materials (such as cardboard, newspaper, aluminum cans, plastic bottles, and glass containers) to all be placed in the same bin. When we are so accustomed to ease of curbside collection and other convenient methods of recycling, it’s hard to imagine how complex process actually is. 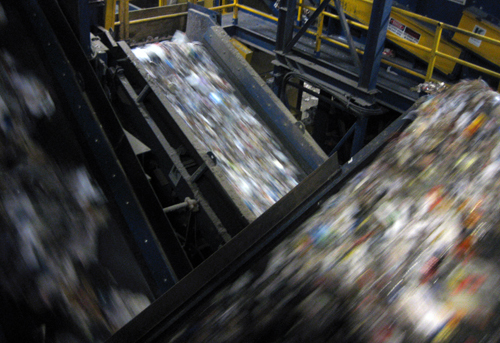 The single-stream MRF that PSI visited was highly automated and use cutting edge technology in order to separate materials. 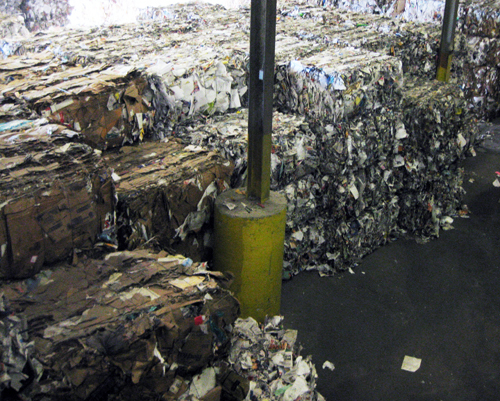 The Charlestown MRF recycles around 750 tons of material every day and the most common material that is recycled is newspaper, which accounts for 60% of all the materials that are processed at the Charlestown site. The inflows of recyclable materials are highly seasonal, with some of the largest fluctuations coinciding around the holiday season and also university events such as graduations and moving days. 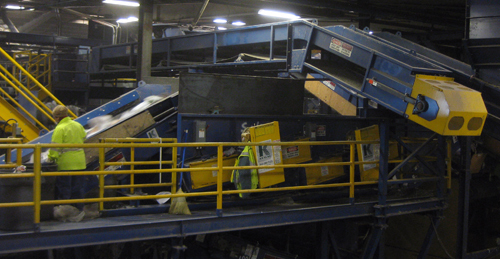 The first step in the recycling process is taken when trucks deliver loads of recyclable material to the MRF. The materials are dumped in large piles, which are then pushed onto conveyer belts by bobcats (also known as skid steers). Metering chains make sure that the materials are not stacked too high and will not encumber the sorting processs. 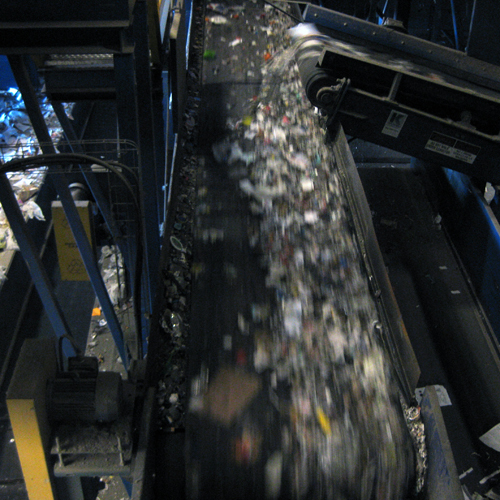 With all the materials spread out along the conveyer belt, the pre-sorting begins. 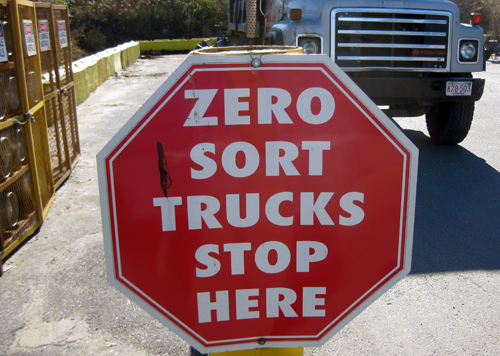 The pre-sort is a labor-intensive step where materials that are not recyclable, or that may damage the equipment, are removed by hand. Plastic bags are by far the biggest contaminant in the recycling process, and are not able to be recycled once they get to the MRF. It is important to remember that even if you have good intentions and wish to recycle your grocery bags, the bags can slip through the pre-sort and end up in bales of other material. If a bale reaches a certain level of contamination, it can be rejected by a mill and must then be reprocessed, which requires additional energy, recycling time, and money. Everyone should reuse plastic bags as much as possible, and consider purchasing a durable canvas bag for shopping needs. If you want to recycle the plastic bags accumulating in your household, bring them to a store that collects them and don’t put them in your recycling bin or they willbecome a contaminant. There are national retailers offering collection programs across the country. Lowe’s and Target both offer complimentary recycling stations for plastic bags and you should be sure to check with you local grocer or retailer to see if they offer similar services as well. 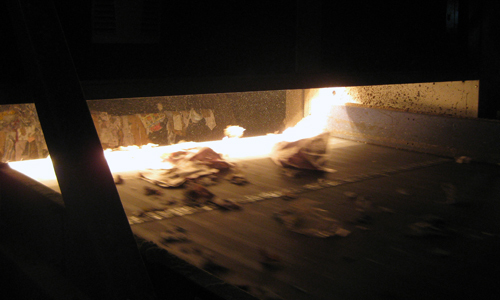 With the pre-sort complete, a series of screens then separates out light paper products, such as newspaper, from heavier products that will fall through the screens and move onto a further series of conveyer belts. The smallest objects, typically broken glass and shredded bits of paper, falls through the screen and sent to a belt beneath the entire system of screens, while the plastics and metals continue on. 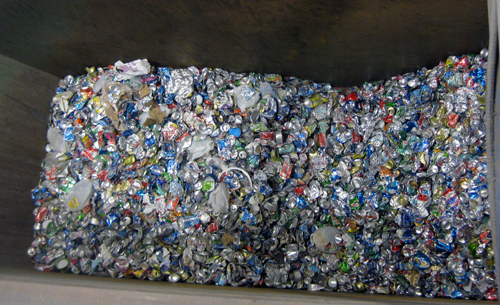 Next, magnetic fields are used to force metal cans from the main conveyer belt. A magnetic current is calibrated so that steal and tin products are separated into one bunker, and a reverse magnetic field is used to so aluminum products are separated into another bunker. 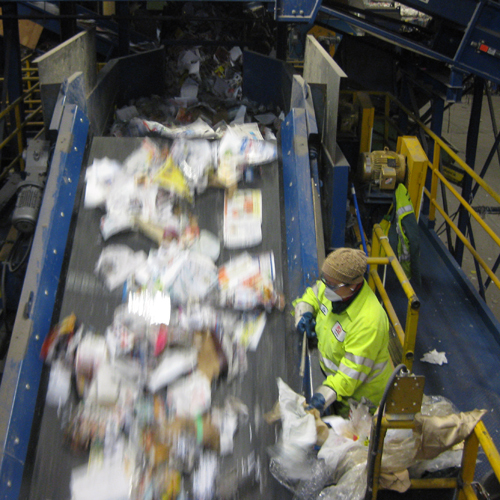 Now that paper and metals have been removed from the conveyer belt, plastics are further separated by their physical properties. 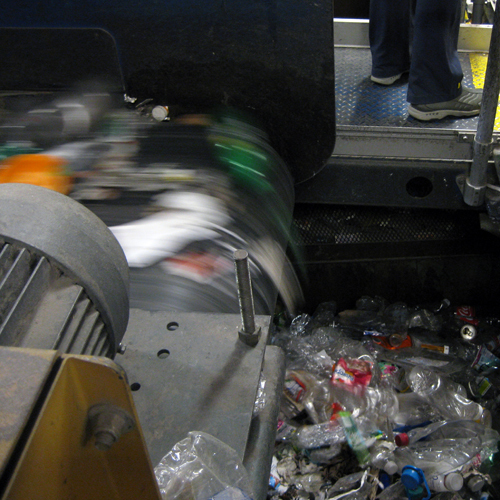 An optical sorter separates clear plastics, such as soda bottles, from opaque plastics, such as milk jugs. When the optical sorter identifies a material as a certain type of plastic, different forces of compressed air are shot at the conveyer belt and are adjusted to propel separate types of plastics into separate containers. Once all the materials are sorted they are separated into bales that are sold to mills in order to be reprocessed into familiar products. Just a few examples of new products created from recycled materials are plastic bottles that will be converted into carpet and fleece, tin cans that will become rebar and bike parts, and cardboard which will be reclaimed as a lower grade of paper product such as cereal boxes. It is important to recycle as much as you can in order to create great products out of used materials, but it is important not to recycle material that may contaminate loads. Don’t hesitate to call your local waste management service provider to determine what materials are acceptable in your area. For those covered by Casella’s service you may visit http://www.casella.com/what-we-do/who-we-serve/town for more information. On Monday, Oct 4th my colleagues and I on the Seattle City Council passed Council Bill 116954 establishing an opt-out system for yellow pages phone books in Seattle. Before I get into the details of the ordinance, I want to talk about scale. The challenges we face in our waste stream are massive – Seattle still sends a mile-long train of garbage to the landfill nearly every day. Yellow pages directories are one of many products filling our garbage and recycling bins, and we know even if Seattle successfully eliminates 50% of the yellow pages delivered in the city that is merely a drop in the bucket. I see two ways to scale our opt-out system up in a way that will transform today’s modest effort into something much more significant. I hope those of you reading this blog will help. The first is expanding the geographic scale. Seattle will model a system that other jurisdictions can easily replicate by contracting with a third party vendor to build an opt-out list that other cities and states can easily join. We believe we have devised a model that will withstand the legal challenges that the industry will almost certainly bring. And I can attest to the political popularity of this effort – well over 95% of the comments we received were in support. The second way is to scale to different sources of waste. We believe this is the first time that producer responsibility principles have been used to address solid waste products that don’t have toxicity issues. By law, all paper in Seattle must be recycled, but even then, this recycling of yellow pages costs the city and its ratepayers about $350,000 per year. The yellow page industry profits by shifting these disposal costs to the public and our recovery fee puts that cost back on the Yellow Pages publishers. This dynamic is not unique to the yellow page industry, and we need to identify the other areas where product life-cycle costs are being egregiously born by the public. Requires yellow pages distributors to obtain a city business license and file annual reports on the number and tonnage of yellow pages distributed in the city (distributor is defined as those who publish and arrange for the distribution of more than 4 tons of unsolicited yellow pages phone books annually). Creates a City of Seattle “opt-out” site. Licensed publishers are required to download the names from this list 30 days prior to delivery and are not allowed to deliver to those on the list. Places a recovery fee of 14 cents/book on all yellow pages phone books distributed to cover the cost of administering the opt-out system and $148/ton to cover the cost of recycling. The effort was fueled by local zero waste advocates who asked for help eliminating waste from unwanted yellow pages phone books. 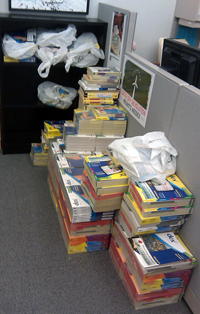 This was followed by the City Council establishing phone books as one of our “zero waste” priority products for 2010-2011. When Dex began its delivery cycle this summer, I received a set of directories despite having opted-out earlier in the year, and one of my aides received a Verizon Superpages book by simply moving to a new address in the same week. In response, I posted an informal request for unwanted yellow pages books on my blog. 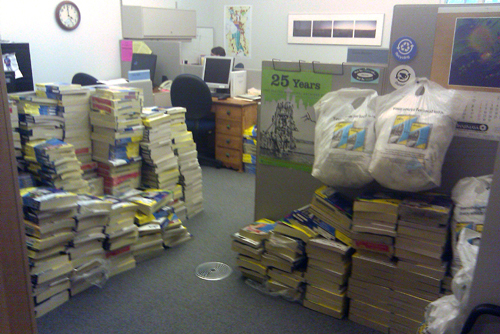 Soon my office was crammed full of books. This was a photo opportunity and story that the press jumped at. Over the summer the issue was featured on all four local tv stations, the news paper, and a couple radio news programs. As the public response poured in, it was almost universal support. As we drafted legislation, the Council looked at many options – both opt in and opt out – before settling on an opt-out system that really “works.” For us, a functional opt-out system would both collect the preferences of as many people as possible, and would “work” on the back end, meaning if you opted out, you wouldn’t receive a yellow pages book. Part of the challenge in either system is participation. Many people simply won’t take the time to enroll in either an opt-in or opt-out system, making it difficult to capture actual preferences. So, as the City of Seattle launches its opt-out list next spring, we’ll be working hard to communicate with and educate our residents and customers, making it easy to access the list and specify their preferences. In addition to a user-friendly website, this means providing information in utility bills, via pre-paid postcards and educational pieces in language-specific newspapers and media. We are hoping to create a system here in Seattle that other cities can model. We’d love to hear about how other jurisdictions are managing yellow pages phone books and how we might coordinate a national effort to bring this to scale.